2003-08-07. New. Ships with Tracking Number! INTERNATIONAL WORLDWIDE Shipping available. Buy with confidence, excellent customer service! 1994-12-20. New. Ships with Tracking Number! INTERNATIONAL WORLDWIDE Shipping available. Buy with confidence, excellent customer service! 1994-12-20. Good. Ships with Tracking Number! INTERNATIONAL WORLDWIDE Shipping available. May not contain Access Codes or Supplements. May be ex-library. Shipping & Handling by region. Buy with confidence, excellent customer service! Westview Press. PAPERBACK. 0813340675 Special order direct from the distributor . New. Westview Press, 2003-02-28. Second Edition. Paperback. Used:Good. 2003-08-07. Good. Ships with Tracking Number! INTERNATIONAL WORLDWIDE Shipping available. May not contain Access Codes or Supplements. May be ex-library. Shipping & Handling by region. Buy with confidence, excellent customer service! Westview Press. PAPERBACK. 0813340675 New Condition. . New. Westview Press. PAPERBACK. 0813340675 Like New Condition. . Fine. Perseus Books, March 2003. Paper Back. Good. The methodology of this very recent study of the Russian Orthodox Church under the Soviet regime bears witness that cold statistics tell a great deal about the seventy-year horror story. 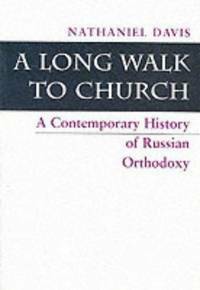 Of the myriad examples given in this book, try this one: Before the Bolshevik revolution there were over 50,000 churches in Russia, and at least 50,000 priests. At the height of Soviet repression on the eve of World War II in 1939, there were left only 200-300 churches, 300-400 priests, and four bishops in the whole of the Soviet Union, a situation described by Davis as perilously close to institutional extinction. Davis's heavily documented study (a quarter of its length is made up of footnotes) follows the twists and turns of Soviet policy toward the Church, and the Church's resistance, sometimes overt and heroic, most of the time simply dogged, to the most severe and pervasive persecution in the history of Christianity. Edges slightly soiled and bumped, a nice copy. Westview Press, 1994-12-20. Paperback. Used:Good. Boulder, CO: Westview Press, 1995,. pbk 381pp remainder mark on bottom edge otherwise . Westview Press, 2003-02-28. Paperback. Good. Routledge. PAPERBACK. 0813322774 Westview Press; Boulder, 1995. Trade paperback. A Very Good, light wear/scuff marks to covers, some fading to covers and spine, lightly sunned pages, tight binding, interior and extremities tidy, some scattered foxing to text block edges, light rub marks to bottom text block edge, a nice, clean and unmarked copy in wraps. 8vo[octavo or approx. 6 x 9], 381pp., indexed, bibliography. We pack securely and ship daily w/delivery confirmation on every book. Please Note: Depending on site, actual book for sale may differ physically from picture listed. Additional Scan(s) are available for any item, please inquire. . Very Good. Westview Press, 1994-12-20. Paperback. Good. Westview Press, December 1994. Trade Trade. Very Good. Very Good Softcover. Light soiling and shelfwear to covers. Sticker residue on back cover. Pages clean and tight in binding. Pictures available upon request. A locally owned, independent book shop since 1984. Routledge, 1994. Paperback. Good. Disclaimer:A copy that has been read, but remains in clean condition. All pages are intact, and the cover is intact. The spine may show signs of wear. Pages can include limited notes and highlighting, and the copy can include previous owner inscriptions. An ex-library book and may have standard library stamps and/or stickers. At ThriftBooks, our motto is: Read More, Spend Less.Dust jacket quality is not guaranteed. Routledge, 1994. Paperback. As New. Disclaimer:An apparently unread copy in perfect condition. Dust cover is intact; pages are clean and are not marred by notes or folds of any kind. At ThriftBooks, our motto is: Read More, Spend Less.Dust jacket quality is not guaranteed. Routledge, 1994. Paperback. Good. Disclaimer:A copy that has been read, but remains in clean condition. All pages are intact, and the cover is intact. The spine may show signs of wear. Pages can include limited notes and highlighting, and the copy can include previous owner inscriptions. At ThriftBooks, our motto is: Read More, Spend Less.Dust jacket quality is not guaranteed. HarperCollins, 1995. This is an ex-library book and may have the usual library/used-book markings inside.This book has soft covers. In good all round condition. HarperCollins, 1995. This is an ex-library book and may have the usual library/used-book markings inside.This book has soft covers. In fair condition, suitable as a study copy. Westview, 1995. Paperback. Good; wrappers slightly stained, corners slightly bumped. 381 pages.